I put this 1963 session on the player yesterday and let saxophonist/flutist/bass clarinetist/composer extraordinaire Dolphy blast away; I am still putting my living room back together. 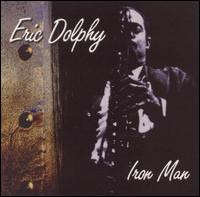 Hyperbole, of course, but it underlines Dolphy's genius, and Iron Man highlights both his mastery of large group format and the balancing act of merging Modernist ensemble jazz, in the tradition of Monk and Mingus, with improvisation that tempts the abstract harmonica edges of Coltrane and Pharaoh Saunders. What emerges, though, isn't emulation in the slightest, but a new, vibrant, exquisitely abrasive sound. Dolphy carves up and flays forth with solos that are fluid, quick cut, full of pops, exclamations, and savage sonorities, and the band, including trumpet genius Woody Shaw and the very fine vibraphone work of Bobbie Hutcherson, compliments the dark, churning backdrop behind the leader's quicksilver delivery. Dolphy took up Mingus's ideas of starting within the chord progressions and then to attack the walls of what was restricting him, venturing beyond the barely comprehensible tones and textures of the individual notes and sending out probes into what lies beyond the formulations of sound that pleased the human ear. He didn't quite reach the heart of the sun, for which I am glad, because in any sense of the metaphor, he would have been finished with his mission to make his instruments create a jazz sound where none like existed previously. He died too young, yes, but we can also say the fire the started hasn't burned out. This music continues to burn hot and brilliant in the moonlight it defies. TAKE A GANDER is an incredible album. It can even clear up bad skin.